Hepatocellular carcinoma (HCC) is a common malignant affecting approximately-one million of people around the world every year. This study aimed to early recognition of the carcinogenic effect of N-nitrosodiethlyamine (NDEA) on hepatocytes and expression of Fas-L and Caspase-3. 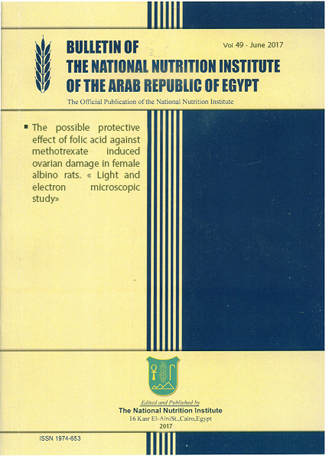 The study was done using tissue homogenate of 60 male albino rats divided into 2 groups: group 1,control group (30 rats) and Group 2, -N-nitrosodiethylamine (NDEA) treated group (NDEA, in a single dose 200 mg/Kg wt and; Carbon tetrachloride (CCL4), twice per week 3 ml/Kg wt) (30 rats). 10 rats from each control and treated group were sacrificed at the 1st, 2n , and 3rd months of the treatment for evaluation (1) of glutathione s transferase(GST), glutathione peroxidase (GPx), glutathione reductase (GRase), glutathione reduced form (GSH), superoxide dismutase (SOD) levels, (2) studying expression of Fas-L and Caspase-3 and (3) for histopathological examination. The results revealed that the treated group antioxidant enzymes levels (Glutathione family and SOD) showed a significant decrease with gradual rates through the three months of the treated compared to the control group, whereas the GRase level was significantly increased compared to the control group. Caspase-3 and Fas-L in liver tissue homogenate in the treated group was significantly decreased in comparison with the control group. The histopathological results showed pronounced changes with evident fatty degeneration (steatosis), marked microvascular steatosis with malignant hepatocytes amounting grade 1. Finally, study can conclude that investigation of liver tissue markers induced by the chemical carcinogen NDEA at different stages of the development of cancer could help in getting more information about the development of HCC and more investigated studies on Caspase-3 and Fas-L, could be a promising way for the treatment of HCC.